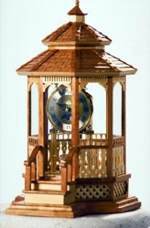 Gazebo Clock woodworking plans - Enclose quartz anniversary movement in glass. Here is a gazebo case combined with an anniversary clock movement for a striking Gazebo Clock. Extensive detail adds to this elegant Victorian timepiece. The plans are full size and include information for adding the optional glass enclosure and shingling. The roof opens for easy access to change batteries and adjust the time.